It’s no secret that regular exercise can have a positive impact on the body, but did you know it can also do wonders for your mental well-being? Burning calories, releasing endorphins, and building community are all aspects of team exercise. One of our favorite activities to benefit mental and physical health is an active sport, like volleyball. 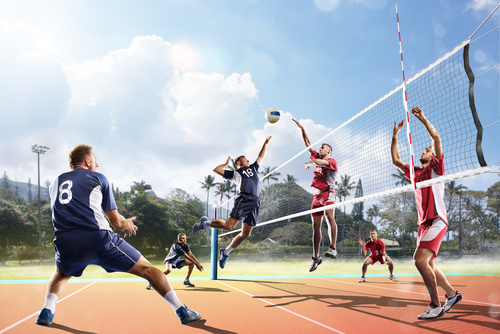 Volleyball is a competitive sport of two teams with six players separated by a net. The object of the game is to get the volleyball over the net by passing the ball and communicating with your team. Many rehab facilities have volleyball courts for the patients to play a game in. There are many physical and mental reasons why volleyball has a place in treatment facilities in order to build a sense of community among patients and keep them physically and mentally strong. In volleyball, your upper body is strengthened as well as your arms, shoulders, thigh and lower leg muscles. It can also tone and strengthen the cardiovascular and respiratory system. Volleyball can help circulate more blood, oxygen, and nutrients into the body as well as enhance your energy levels to improve your overall well-being. You can also develop improved hand-eye coordination and fast reflexes. Volleyball is also a great way to burn calories since according to FitnessHealthZone.com, you can burn up to 585 calories playing for forty five minutes. Volleyball is a great team sport because it takes more than one person on your team to win the game. It involves working cooperatively and in a fast pace in which those lessons can be used outside of your treatment facility such as when you go to work and you have to work well with your co-workers and your boss. It can improve your mood, reduce stress, and can encourage you to have pride in your accomplishments not just because your team won the game but for being a great team player. As you complete sets, bumps, serves, and spikes successfully, you will feel confident in yourself in being able to master them. Volleyball involves communicating with your teammates as you pass the ball to each other and ensure that you are open whenever the ball comes your way. You will not win if everyone on the team is trying to be the star and criticizes the other for missing the ball or not hitting it over the net. You will learn that being a team player involves encouraging each other to do the best and that it is just a fun game in the end. Volleyball is a great way not only to be in great shape and having an elevated mood but to learn about the important lessons of teamwork that you will always carry with you. The Center for Professional Recovery offers the Professional Treatment Program, designed specifically to address the unique needs of professionals, like first-responders. Our programs are designed to treat co-occurring disorders which might arise and restore first-responders in a way which allows them to return to work and continue taking care of their mental health. « How does PTSD Affect Veterans?